Technical degrees are composed of science, technology, engineering and mathematics (STEM). Of the 88,000+ students enrolled in Rotterdam, 11% are following a STEM course. 1,660 students graduated with a STEM degree in Rotterdam in 2017. Technology degrees accounted for 36% of these diplomas awarded. ONLY Engineering degrees were more common, accounting for 45% of diplomas. When students from Delft are included, the percentage of students enrolled in STEM courses rises to 28%, and the number of STEM graduates to 6,200 per year. As such, TU Delft accounts for 67% of tech talent in Rotterdam and Delft combined. This points to the importance of Delft as the major source of technical talent. The compound annual growth rate (CAGR) of overall STEM enrolment since 2013 is 7.5%. The four major knowledge institutions at university and hogeschool level are TU Delft, Hogeschool Rotterdam, Erasmus University and Inholland Hogeschool. While TU Delft is almost exclusively focused on STEM programmes, Erasmus has less than 8% of its students enrolled in STEM programmes. Since Erasmus is the only university (WO-level) in Rotterdam, this underlines the dependency on Delft for highly-educated tech talent. A complete overview of all STEM programmes. A closer look at the population diversity of STEM students points to the lack of both female and international students. Females account for only 25% of STEM-enrolled students, while Males account for 75%. Similarly, international students make up only 14% of STEM students in Delft and Rotterdam. 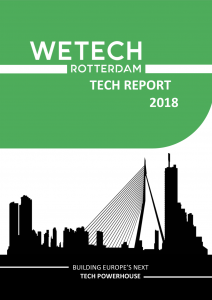 At MBO level, too, tech education in Rotterdam has seen a slight increase since 2013. MBO students can specialize in Technology, Economy, Health & Wellness, Sustainability or mixed studies. It’s positive to see that technology is the greatest of these sectors, accounting for almost 34%. The absolute number of MBO students specialized in technology has grown with a cumulative annual growth rate (CAGR) of 4.6% since 2013.